We provide data management software that allows organisations to maintain control of their data by identifying the different data types and classifying the information so that decisions can be made on where it is stored (disk, tape, optical or cloud), migrated, kept or deleted. This data could be stored across a number of operating systems and storage platforms including NetApp, EMC, HP, IBM etc. The easiest way to manage data is to keep everything forever. Data management is fine if you only have a few terabytes of data that can fit on a couple of hard disks. Unstructured Data is the biggest headache today for any organisation today is trying to control and manage data consumes over 70% of all information stored and is growing at 61% per annum! The problem is that 2TB’s isn’t really 2TB’s it could be 4TB or 6TB+, backup, replication and previous instances of data are retained on a variety of electronic media and this overtime creates data sprawl. Firstly let’s understand what we are dealing with. Data management software can easily identify unstructured data, this type of information is typically not stored in a database. 1. “TEXT” can be e-mail, texts, word documents, presentations, spreadsheets, messaging systems, Twitter, Facebook etc. 2. “RICH MEDIA” can be images, sound files, movie files etc. As we have explained, unstructured data consumes vast amounts of storage, but another consideration is legislation. Where this data resides is important if you need to retrieve the information for a compliance audit or lawsuit. This type of data is organised and easily accessible such as databases and large search indexes. This type of data is also very fast to retrieve and interrogate for analysis or usage patterns. How organisations identify unstructured data is of vital importance to find whether it has an intrinsic value to the business or the next lawsuit waiting to happen. 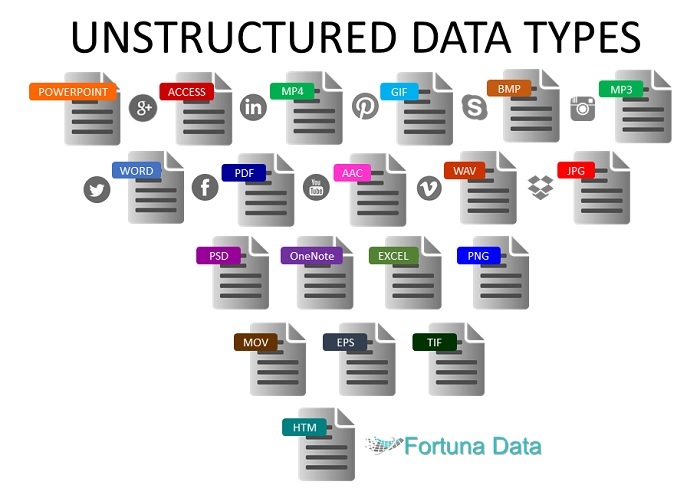 Firstly we need to identify the types of unstructured data and where it currently resides. How much unstructured data do we have? How many copies of the same file do we have? On which systems and data storage platforms does the information reside? When was it last accessed? What size is the file data? When was it last modified? Is the data relevant to the business? How many copies do we have? Do the files need to be archived? Should the data be restricted? Who is generating this data? Does the business need to retain the data for legal or compliance reasons? Can it be deleted after “X” years? Unstructured data that is only accessed once a year, but sits on a tier 1 storage platform requires power and cooling. A properly implemented data management software solution will “Save Money“. Negate the need to continually buy new systems to handle the additional data. Reduce the complexity of data sprawl allowing control of where key data resides. Ability to migrate data to the cloud. Improves legal searches and hold. Helps the organisation stay compliant regarding the types of data that it stores. Reduces backup requirements and sofware licensing. We work with some of the world’s leading data management software companies to provide solutions that help identify the various data types spread throughout your organisation and can provide the hardware and software to enable your organisation to become more compliant, improve search and indexes whilst saving money. If you are in need of our help, find out how a large construction company migrated 100TB’s of data sprawl to Microsoft Blob Storage. If you would like to know more call us on 01256 331614 or 0207 193 5760 or complete our form below.